The 3m x 1m solid Oak dining table, with powder-coated steel splayed legs, was designed and manufactured by Glen Thomas Architecture. The house has been ripped open, internally, with sliding pocket doors allowing the spaces to be closed off into snugs when desired. Real wood burners, integrated ceiling speakers and mood lighting, offer the choice of free open plan circulation OR warm intimate snug spaces. 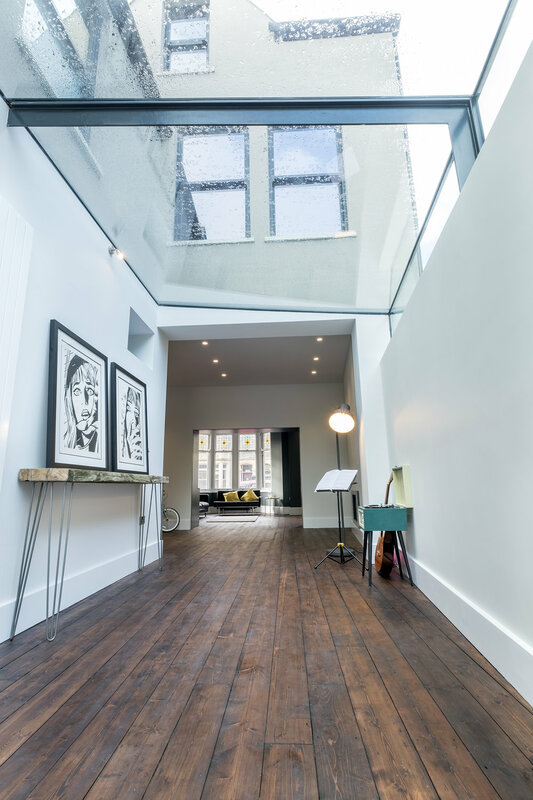 The bespoke frameless glass roof was designed by Glen Thomas Architecture and fabricated / installed by CLEAR LIVING LTD (Cheshire). The enormous span of the flat glass roof, meant that the glass panes had to be made in Germany and lifted onto the structural opening by crane. The beautifully hand made real wood kitchen was designed by Glen Thomas Architecture and made by spanish kitchen firm DOCA. The painted bookshelves and wardrobes throughout the property were designed by Glen Thomas Architecture and fabricated by Cardiff joiner, Steve Williams & Son. All of the ground floor has been made open plan with sliding disappearing pocket doors by SELO, allowing zones to be connected or private. All of the modern carpentry/ bookshelves have been designed to respect the re-furbished original Victorian cornice detailing. The dark grey Aluminium cladding, with full height lift and slide solar control glass doors, reclaimed stained timber floorboards and Welsh slate tiles, blend beautifully the outside with the inside ; the old and the new. The existing Victorian architectural charm is retained with colours and textures of its time, whilst the additions unashamedly reflect the way we build today. The dark aluminium and glass flat roof extension, sits neatly behind the reconstructed original stone wall. 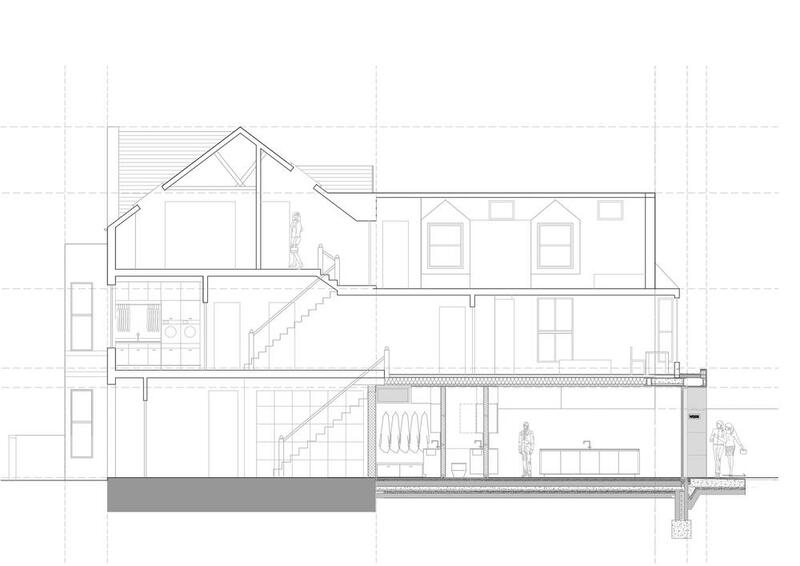 The minimal EN-Suite was designed by Glen Thomas Architecture. The simple glass steam room screen was fabricated and installed by ASHDOWNS, Cardiff. The steam room equipment was supplied by BOSS Leisure, Bridgend. 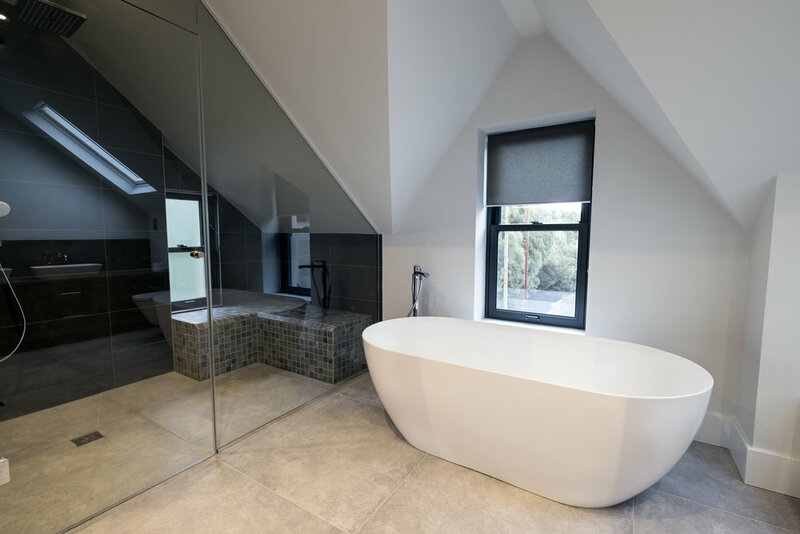 The loft space has been completely opened up to form the Master Bedroom, with 180 degree opening full height blank doors, into the En-suite Bathroom / Steam Room. 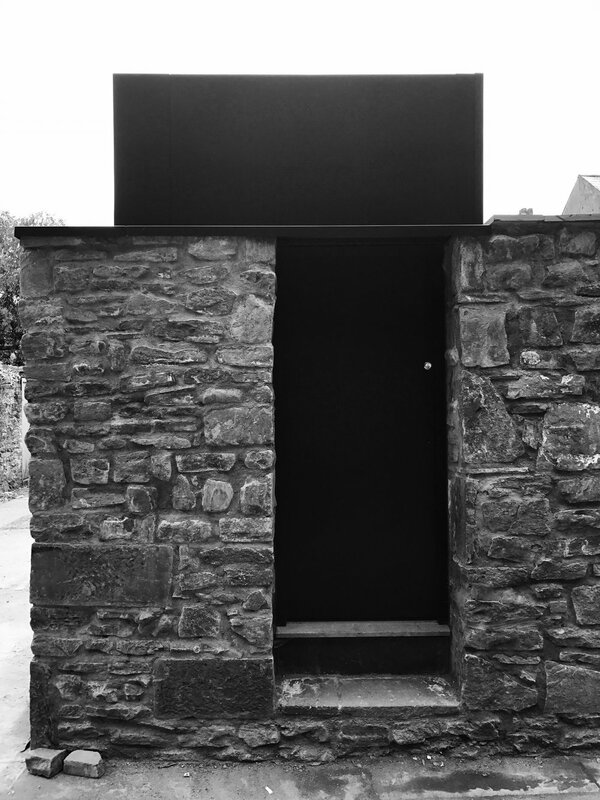 Black Aluminium clad box, Victorian stone wall.